← I want your GELD! TAKE THAT! Erika Barolli, 10, and her brother, Robert, 12, in a Krav Maga class. “The groin!” exclaimed Madison Schiavi. He turned to an onlooker. Krav Maga is enjoying an unusual burst of popularity among American children who might otherwise be practicing karate chops. Born in the Jewish quarter of Nazi-infested Bratislava, then part of Czechoslovakia, in the 1930s and embraced by the Israel Defense Forces after the founding of Israel in 1948, Krav Maga (“contact combat” in Hebrew) spent decades in America as a cult activity inside a handful of gyms in Los Angeles and New York. But in recent years, the no-holds-barred technique has been introduced as a martial arts class in cities and towns across the country. Among the students are children whose parents worry about “stranger danger,” women who want to protect themselves, security guards at psychiatric hospitals and teenagers scared of high school bullies. The spread of Krav Maga follows its quiet adoption by police departments, including those in Chicago, Memphis and Lubbock, Tex. Government agencies, including the Drug Enforcement Administration and the F.B.I., along with — not surprisingly — the Army, Navy, Air Force and Marines, have been training in the technique for at least a decade. Now even Hollywood is getting in on the act. For his role in the romantic comedy “Killers,” Ashton Kutcher studied the method for several months. For his real-life role as bridegroom in his coming wedding to the pop singer Katy Perry, so did Russell Brand — as a way to get in shape, not to gird for prior paramours who might crash the reception. 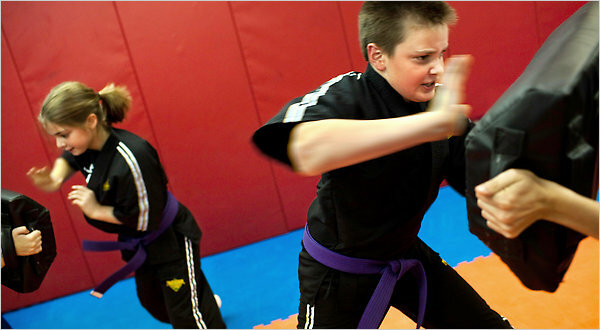 At Premier Martial Arts, the studio Mr. Arute opened in March 2008, around 100 schoolchildren train weekly in the fine art of tearing attackers to pieces. Tuition is $2,000 a year for unlimited classes. There are no Zen-like moves, à la Obi-Wan Kenobi. It is all about getting down and dirty in the interest of saving your own skin. “All right, let’s move on to two-handed chokeholds,” Mr. Arute called out. The children paired off, one throwing the other up against a wall, hands around the neck, and the victim using a signature Krav Maga move involving raising a bent right arm, then coming down and twisting out of the hold. Krav Maga is taught regularly to Israeli schoolchildren and is even approved by the Israeli Ministry of Education. But would this work in real life? Could a child really fend off an adult four times as big? Yes, insisted Mr. Arute. Madison’s father, Richard Schiavi, who owns a stump grinding company, nodded. What if the child tries to practice on a sibling, perhaps, or the family cat? At each lesson, Mr. Arute reminds students that the moves are to be used only defensively, and only in case of serious danger. Because Krav Maga is still a mom-and-pop business, no one tracks how many studios have opened in recent years, or how many traditional gyms have added classes in the discipline. But a Web search shows hundreds of new studios opening in recent months, from Raleigh, N.C., to Katy, Tex., and various associations vying to “certify” instructors. One of them — Krav Maga Worldwide in Los Angeles — says that it has certified some 240 training centers around the world, with each center having anywhere from a few hundred to a few thousand members, half of them women. Besides teaching skills that the students hope they never have to use, Krav Maga offers a good workout. Toward the end of Mr. Arute’s 45-minute class — which included wind sprints, push-ups and punching against black pads — the children were sweating. He reviewed the basics. Always back away facing your attacker before turning to run. Never hit the ground — you’re vulnerable. Stay in the fight. Remember to breathe. One easy technique that seems to work surprisingly well: if a stranger grabs you by the wrist, make a ball with your grabbed hand, bring your other hand over to grab the ball, and pull up quickly. Then turn and run. Joshua Neff, 6, declared the class fun. “You get to protect yourself and know what to do if you’re in danger,” he said. Madison Worthy, 11, who attends school in a rough neighborhood of New Haven, nodded. She said there had been nearly a dozen fistfights in the hallways of her school during lunchtime; a teacher had suffered a concussion; and last February, the principal had been slugged.